The Aten KA7240 is a USB Console Module with Audio support that provides the means to access Matrix KVMs. It allows up to 900 feet separation between console and CPU module over CAT-5 (or better) cabling. When used with a KA7176 CPU module (sold separately), the console supports audio and virtual media through the KVM to the attached servers. 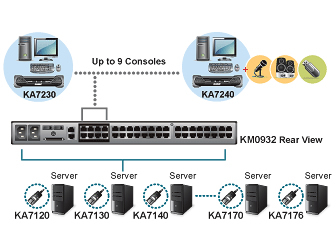 In addition to providing a connection to the Matrix switch, the KA7240 acts like a KVM in that you can connect your work station to the console port , leaving a single keyboard, mouse, and monitor on your desk to control both the servers attached to the KVM and your desktop workstation. Additional features of the KA7240 include the ability to use any combination of PS/2 or USB keyboard and mouse. A built in RS232 port allows an Administrator to monitor all logged on users and dynamically switch or deny a user access to a particular server or even access to the KVM itself. 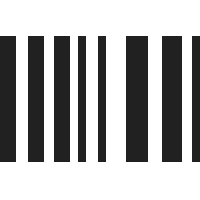 In a large server environment, this feature may be used to project the display on a screen to provide an over view and control of each logged on user. Superior video quality - 1280 x 1024 @ 60 Hz for up to 1000ft. 8.9 x 2.1 x 6.75 in.